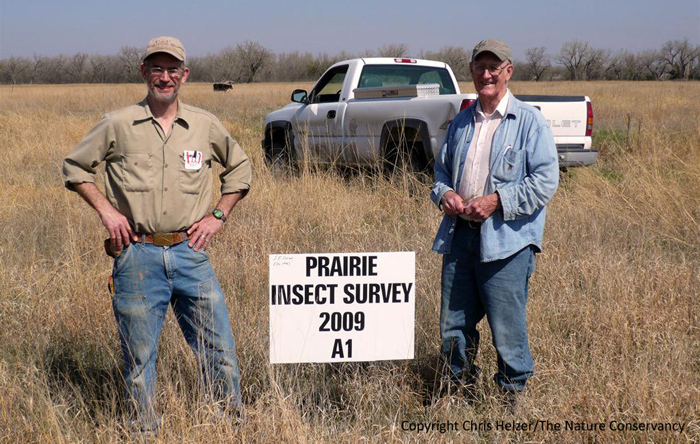 An Early Attempt to Evaluate Prairie Restoration Success by Looking at Insect Use. Back in February, I wrote a post that laid out some ideas about how to measure success when using prairie restoration (reconstruction) to stitch fragmented remnant prairies back together. One of the main needs is to see whether species from the remnant are also using the restored prairie. If I’m trying to make a small remnant prairie function as a larger prairie by adding restored prairie around it, the species in the remnant must be able to expand into and travel through the restored habitat. I just got some data from a couple of volunteer amateur entomologists that apply to that kind of evaluation, so I thought I’d share what they found. First, let me be clear that these are amateurs (“enthusiasts” may be a better term than “entomologists” – though they are much better at insect identification than I am!) and that these are not research data. However, what they found was very interesting, and will make a good launching point for future work. Four species of tiger beetles were among the insects found during the 2009 inventory work. In early 2009, I was approached by Chris Aubushon and Connie McCartney, who live in Grand Island, Nebraska – near our Platte River prairies. Chris and Connie were initially just looking for new sites to hunt for insects, but as we talked, we developed a bigger idea. They volunteered to come out once a month for during the 2009 growing season and collect as many insects as they could from 6 sites and to identify what they could. The six sites were really three sites where I had a restored prairie next to a remnant prairie, and they collected insects from both the remnant and restored portions of those sites. Chris Aubushon (left) and Connie McCartney (right) setting up plots for their insect inventory project in early spring 2009. Again, this was not a research project, but Chris and Connie – and some helpers – did come out once a month for 5 months and collect a lot of insects. They restricted their sampling to one 100 foot by 100 foot plot at each of the 6 sites, and used a combination of sweep netting and pitfall traps to catch the insects. Chris and Connie were able to identify 136 species from those five months of collecting. They also found (but didn’t identify to species) approximately 33 species of spiders. When I got the list of species from Chris, I sent it to several friends of mine who are knowledgeable about insects to get their impressions. The consensus among those entomologists was that the insects on the list were almost exclusively common species that are habitat generalists. In other words, the list doesn’t include many rare species, or species tied to particularly “good” quality prairies. Instead, Chris and Connie mostly caught insect species that can be found just about anywhere. That doesn’t diminish their efforts, but it’s important to remember as you interpret the breakdown of results. Of the 136 species caught, 28 were seen at only one site. Interestingly, 8 of those 28 species were found only in remnant prairie, while 20 were found only in restored prairie. (I don’t think it is necessarily important, but of the 20 species found only in restored habitat, half were beetles.) Two species – a firefly and a burying beetle were found at two different sites that were not adjacent to each other. In each case, they were found in one restored prairie plot and one remnant prairie plot. 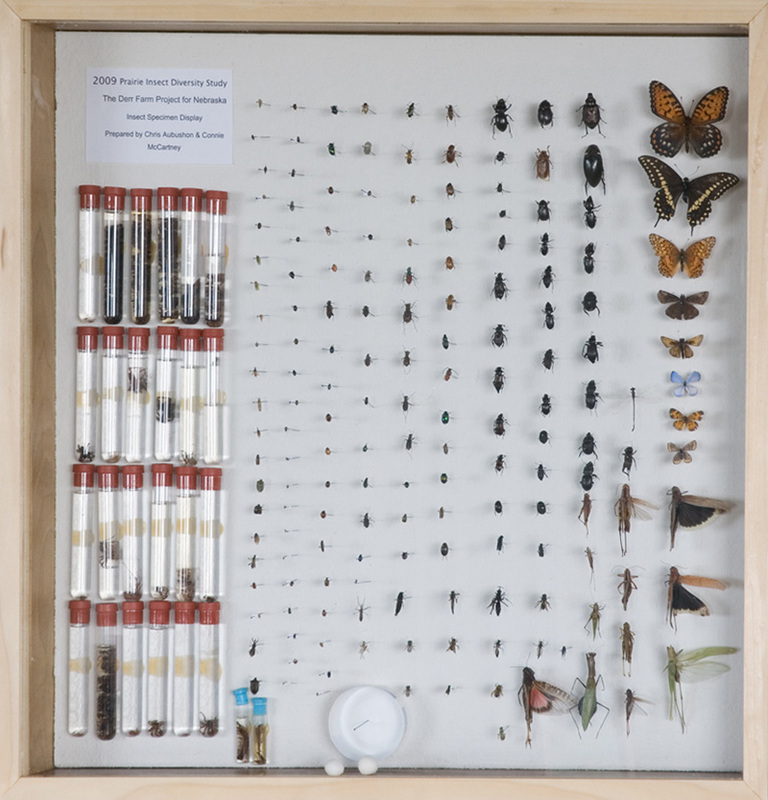 The reference insect collection from Chris and Connie's work in 2009. All of the remaining species (106 of them) were found in both halves of at least one remnant/restored prairie pair. In other words, except for the two species mentioned above, every other species of insect found in more than one place was seen in both the restored and remnant portion of at least one prairie. Remembering that these are all generalist species, I’m still surprised – and encouraged – by those results. I had expected to see at least a few insect speces that were found in remnant prairies but that weren’t yet making the jump into the adjacent restored prairies. In fact, I was kind of counting on seeing that so that I could design some follow-up data collection to figure out what the obstacles might be that were preventing them from using restored prairie. So what have I learned? First, the prairie restoration work we’ve been doing appears to provide adequate habitat for the most common and widespread insect species in our remnant prairies. At least for those species, the restoration work we’re doing is successfully increasing the size and connectivity of fragmented remnant prairies. Third, I’ve learned that the next steps in our efforts to evaluate insect use of our restored prairies will be harder. We probably need to start by identifying species of insects in our remnant prairies that may not utilize nearby restored prairie – based on what we (meaning people besides me) know about their life history. Then we need to do some targeted sampling to see whether they are or are not using those restored prairies. It’d be even better if we could actually track individual insect movement to see if they cross the boundary between remnant and restored prairie. (That should be easy, right?) Broad sampling like we’ve done so far is useful, and a good first step, but now we need to hone in on a few target species and see what we can learn about them. Species that rely on a particular plant species or that are tied to soil organic matter levels may be examples of those we need to study. To sum up, there’s plenty of work to do. To this point, we haven’t found any glaring problems with our restored prairies that are so severe that common insect species are restricted from using them. That’s pretty nice to know, but it’s just the tip of the research iceberg. Now we need to dive in and start working on the rest. I’m extremely grateful to Chris Aubushon and Connie McCartney for all of their hard work collecting, sorting, and identifying insects for this project. It was an amazing effort – and done for the simple love of exploration of the natural world. Thank you. I’m also grateful to James Trager, M.J. Hatfield, and Ted MacRae for helping me to interpret the results of the project. Their comments and insight helped me tremendously as I worked to understand what conclusions I could and couldn’t pull from these data.